The Promise of American Life was first published in 1909. It had an immediate and extensive influence on what social historians call the Progressive Era. At the dawn of the New Deal Era, Felix Frankfurter wrote that Croly's book became "a reservoir for all political writings after its publication. Roosevelt's New Nationalism was countered by Wilson's New Freedom, but both derived from Croly. "While this may have been hyperbole, it is also a reflection of the impact The Promise made on intellectuals coming of age in the days of doubt and hope just before the Fust World War. Arthur Schlesinger Jr., calls this book "a substantive and sensitive essay on the American political experience, worth examination not just for historical reasons but on its continuing merits as a diagnosis of the American condition. "Croly himself summarizes the work thus: "From the beginning the land of democracy has been figured as the land of promise. The American's loyalty to the national tradition rather affirms than denies the imaginative projection of a better future." Croly's book can be viewed as both an affirmation and critique of how the idea of progress works its way out in American life. And reading it at the end of the century only reaffirms one's sense of appreciation of the American tradition as a whole.The technology and science may be different, but the themes covered by Croly show an astonishing continuity of value issues: American Democracy and National Principles, Reform and Reaction; Federalists and Republicans, Nationalism and Internationalism; and the Individual and the National Purpose. All of these themes are central to Croly and remain so to this day. 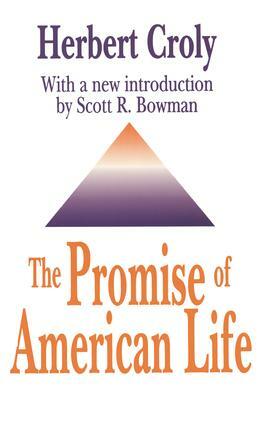 The new, forty-page introduction by Scott R. Bowman, brings the story of The Promise up to date. But it may be studied with a critical eye to the social maladies confronting Americans as a new century approaches.